This post is from Blueprint's blog, Bluelines. Provence — a charming French restaurant in Soho recently taken over by restaurateur Melissa Hamilton and her chef partner, Christopher Hirsheimer (of 5 Points and Cookshop) — has just started serving lunch and brunch. This is exciting not just because the food is yummy (think grilled shrimp with shaved fennel, summer squash, red onion, and a citrus salad) or because the cozy French country ambience makes you want to move in, but because it means more trips to the powder room for stimulating bathroom lit. I’m not talking magazine racks stuffed with Vogue and The New Yorker, or “Jenny hearts Sam” love doodles keyed into stall doors. I’m referring to The Hunchback of Notre Dame, which wallpapers the entire ladies' loo (guys get The Three Musketeers). I just had to interrogate: How did they do this? It turns out that, in true Blueprint fashion, Melissa and Christopher did it all themselves. 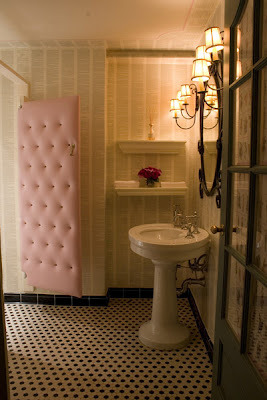 They used hardcover books, which have creamy pages, to give the walls a soft, romantic cast. They cut out the pages using a straight-edge razor and glued them up using wallpaper paste. That part took days. Then, they polished the walls with Polyvine glaze. If some overzealous reader should attempt to swipe a page or two for the subway ride home, never fear: Spare replacement pages are kept in the office.